Simple and convenient: save by choosing a service plan that suits you best! Number of electronic payments in Euro in Lithuania and EEA Member States by your choice: 10, 20, 50 or 100 transfers per month. New contactless debit cards for business. Minimal fee for daily services. Don‘t know which plan to choose? Service Plan “Business Plus” can be ordered together with the main Service Plans for Business or separately if group payments (of wages to employees) are relevant to the company. For more details on the rates of the Service Plans for corporate clients and the general terms of application thereof please see here. With the Service Plans offered by the Bank, you will not have to worry about the price of each electronic transfer or online payment of an e-invoice. The fixed fee for the daily services most necessary to your business will facilitate planning of expenses for the payment services provided by the Bank. Swedbank‘s Service Plans are sets of most popular banking services tailored to the daily financial needs of your business. Upon ordering one of the Service Plans - Business, Business 10, Business 20, Business 50, Business 100 and Business Plus, its terms and conditions will apply to all your accounts with Swedbank, AB, held currently or opened in the future. Also you can select Business Plus as an additional plan for unlimited transfers of wages to your employees to their accounts with Swedbank. You can only select one of the main Service Plans and additionally Business Plus, or just Business Plus. While using the selected Service Plan you will not pay standard bank fees for the payment services covered by the Service Plan. The standard rates for the services and operations of the Bank will apply if you terminate the Service Plan or exceed the restrictions applicable to the Service Plan (e. g. if you order additional debit cards for business). The Service Plans are not available to credit and payment institutions and electronic money institutions. In the event of establishing that the entity operates as a credit institution, payment institution or electronic money institution, the Bank has the right to terminate the Service Plan for such client. You can read the General Terms and Conditions of the Application of the Service Plan Rates here. How to order the Service Plan? You can order the Service Plan through Swedbank’s online banking system for business, or at any branch of the Bank, or by calling 1633. When will my Service Plan be activated? You will be able to use the advantages of the Service Plan straight after ordering. In case before ordering the plan individual (special) fees were applied for the services used by you, not later than during Bank 2 working days those individual fees will be terminated and Service Plane conditions will come into the force. Will the Service Plan apply to all accounts of the company? Upon ordering the Service Plan you will not have to pay the minimum daily service fee for all the accounts opened for your company with Swedbank, whereas e-payments can be made from any account of the company. Please note that the total number of e-payments and payment cards will remain the same as specified for the Service Plan, without any additional charge, and it does not depend on the number of your accounts. How many Service Plans can we order? The company may use only one main Service Plan at a time: Business 10, Business 20, Business 50 or Business 100. In addition, you may order one Business Plus Service Plan. Business Plan is available for new companies that were founded no earlier than 12 months ago, provided that the company has not concluded an agreement on the application of the Business Basket rates. What rates will be applied if payment orders exceed the limit set for the Service Plan? In such a case Swedbank standard rates for services and operations will apply to payment orders. When will the Bank charge my account with the Service Plan‘s fee? The fee for the past month will be debited by the 15th date of next month. The monthly fee will be debited irrespective of whether the company has reached the limit of the services covered by the plan‘s fee or not. Will it be possible to change or refuse from the ordered Service Plan? You may change or refuse from the Service Plan through Swedbank’s online banking system for business by calling 1633 or by vising any branch of Swedbank. Upon refusal, Swedbank‘s standard rates for services and operations will apply. Which payment cards are covered by the Service Plan? Order a new contactless MasterCard business debit card and abandon the old card. 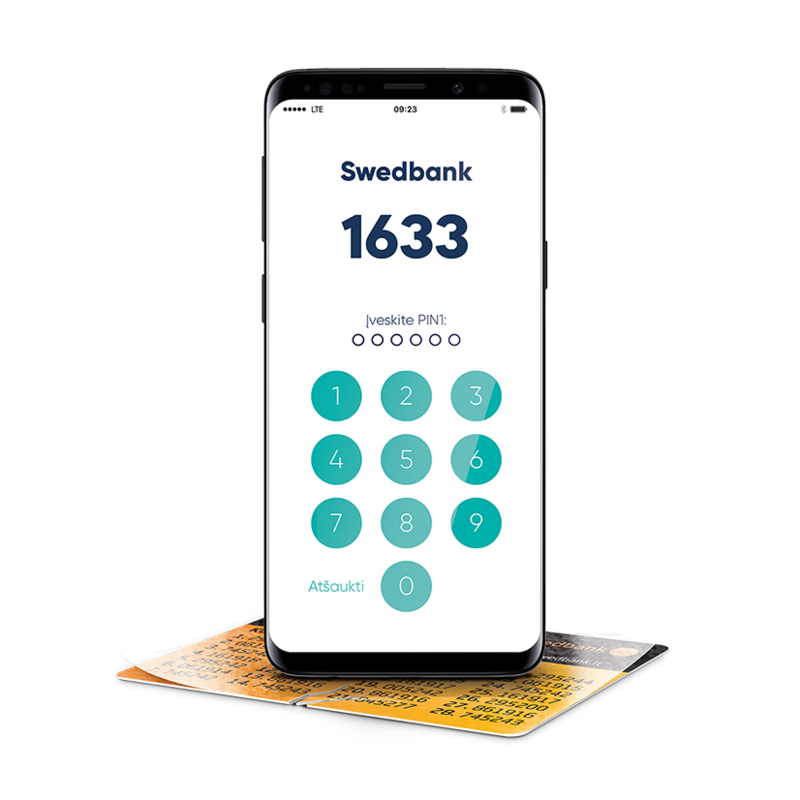 You can order the contactless card through Swedbank‘s online banking system, by calling 1633, or at any branch of the Bank. After your card is collected and activated, it will be included in the Service Plan automatically. A few of contactless MasterCard business debit cards have already been issued to the company. Which of them will be included in the Service Plan? The card must be active, or if blocked the blocking must be temporary. A card that is fully functional has priority; a card with cash pay-in operations only will be given lower priority. A card that was ordered earlier. A card with the largest number. The Bank reserves the right to change these rules at any time. Will the company be able, upon ordering the Service Plan, to receive a PIN code generator free of charge if it has a generator already? Yes, upon ordering the Service Plan you can order one PIN code generator free of charge irrespective of whether the company already has one. The generator will be provided free of charge only once upon ordering the Service Plan, i. e. if you change the plan you will not be able to order one more generator free of charge.